The Copyright Law of the United States is designed to encourage the creation of art and culture by rewarding authors and artists with a set of exclusive rights. Copyright law grants authors and artists the exclusive right to make and sell copies of their works, the right to create derivative works, and the right to perform or display their works publicly. These exclusive rights are subject to a time limit, and generally expire 70 years after the author’s death. To promote the Progress of Science and useful Arts, by securing for limited Times to Authors and Inventors the exclusive Right to their respective Writings and Discoveries. The United States Copyright Office handles copyright registration, recording of copyright transfers, and other administrative aspects of copyright law. There are many, many other aspects to copyright law—too numerous and complex to explain within this website. 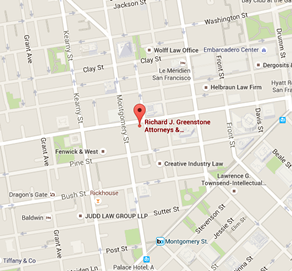 Richard J. Greenstone, Attorneys & Counselors at Law have handled hundreds of copyright application and infringement matters. The firm brings its unique experience in art, publishing, music, and software—all forms of literary expression—to advising clients and other attorneys on matters involving copyrights. We invite you to contact us about your copyright requirements. Call us at 415-438-1890 or write to richard@rjg.com.